Probably you have not heard much about the name of the country where I live. Maybe someone told you that it produces good wines or possesses beautiful landscapes; maybe you heard its name connected to the dictator Pinochet, of a famous rescue of trapped miners, or that its economy is growing in a world in crisis. If you haven’t already guessed, I'm referring to Chile, which is located in the southern cone of South America. Although we are on opposite sides of the planet, we have the same problems that you face in United States: psychics, astrologers, conspiracy theorists, doomsayers, alternative medicine "therapists,” fundamentalist preachers, creationists, and a host of charlatans who prey on the ignorance of people in the streets, either on television or privately. 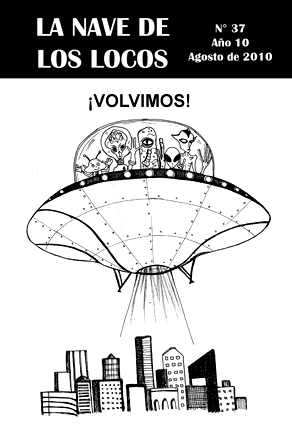 The first initiative that emerged in Chile to spread critical thinking was in 2000, with the magazine called La Nave de los Locos (The Ship of Fools), a bimonthly publication that specializes in UFOs and some parasciences from a rational perspective. The magazine functioned normally until 2006 as the only crusade against the irrationality that pervades Chilean society. Its articles were written by researchers from different countries and were translated into different languages. Finally, in 2010 the Ship of Foolsreappeared momentarily to publish its last edition. Beyond the efforts being made by the group responsible for publishing the magazine, the fight against superstition via the spread of critical thinking and skepticism in Chile was scarce. But things changed. 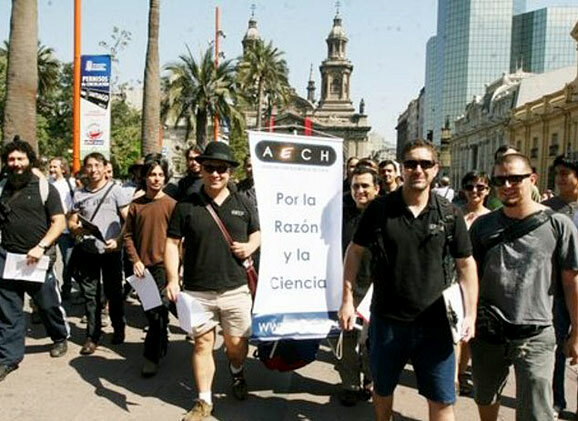 In May of 2010 the Sociedad Escéptica de Chile—AECH (Chilean Skeptical Association) was formed, and in October of the same year, with a friend, we founded Chile Skeptic. 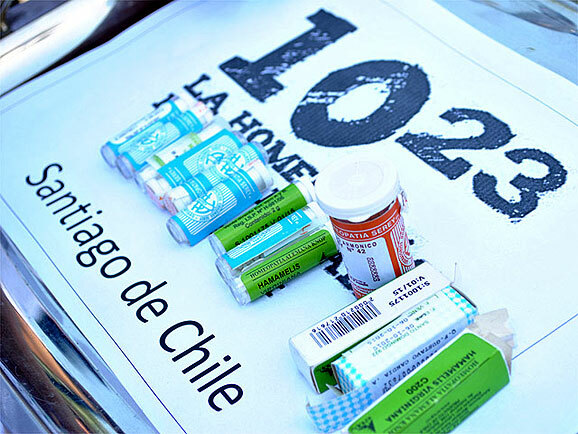 These two organizations have different methodologies but a common goal: to popularize science and rationally answer the pseudoscientific, superstitious, and irrational claims that abound in Chilean society. 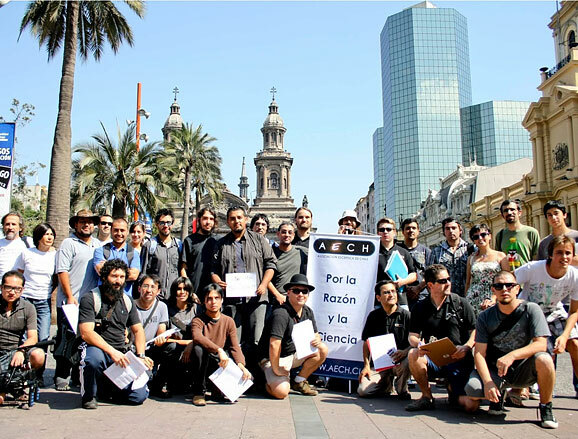 In August 2011, the Sociedad Atea de Chile (Atheist Society of Chile) formed to join to the fight against superstition and irrationality. These two years haven´t been easy, but there have been some achievements. The association started with just three people, and currently has a team of almost thirty professionals from different areas of expertise. 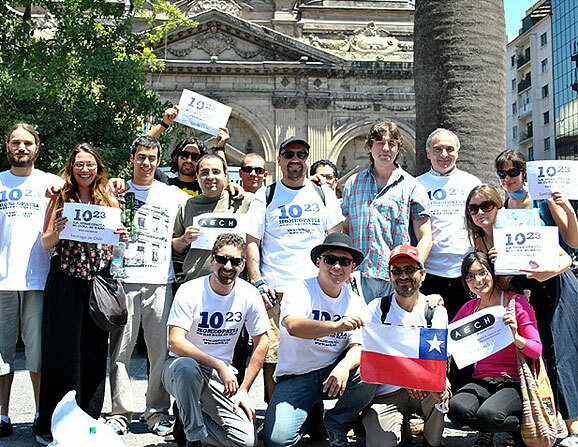 The institution has increased its coverage in newspapers, radio, and TV channels, through which it has generated consciousness by publicly denouncing charlatans and swindlers known nationally, as well as calling attention to the separation of church and state (signed in 1925) that some segments of Chilean society have transgressed in recent times; and of course, promoting critical and scientific thinking that many people lack even in these modern times. AECH organizes a monthly free public lecture about skepticism and/or any area of ​​science, and has carried out striking activities and campaigns. For example, on their website, there is a list of national universities offering courses on pseudoscience (“List of Shame”), and another about various "quacks" who unfortunately are known nationally and have support among many people. But much more noteworthy are the homeopathic suicides of 2011 and “National Apostasy” organized in April of 2012—because despite being a largely Catholic country, many claim to belong to that religion only as a simple matter of tradition or social pressure; unfortunately, the Catholic Church uses these statistical numbers to pressure the government when debates arise on some social reforms. AECH has received offers for programs on Chilean television channels. I conceived of the idea for this group with a friend in early 2010, but the group itself wasn’t formalized until November of the same year. Initially we wanted to put on public events, but for various reasons, including a lack of support, this has been difficult. Our work focuses mainly on translating English publications such as Skeptic Magazine, Quackwatch, Talk Origins, among others into Spanish. We recently started translating CSI publications as well. As a second approach, we also manage science news portals in social media like Facebook and Twitter. Currently, closing in on two years of existence, we are planning a new work program. We´ll begin a cycle of interviews with scientists and nationally renowned persons about topics such as alternative medicine, creation/evolution controversy, GMO, conspiracies, etc., but the main project that we are undertaking is a series of events and public talks with similar themes to those already mentioned. With this, we intend to leave the purely online field to carry out activities with greater impact. One of the first events that we are planning is a dynamic show of illusionism that will show how easy it is to trick the human mind through neurolinguistics, cold reading, cognitive biases, etc. It is something akin to James Randi´s work but with a Chilean flair. In August of 2011 this new group began to take shape with the intention of representing agnostics and atheists in the country. Initially the group gained fame after making its debut with the organization of the First National Congress of Atheism in December 2011. 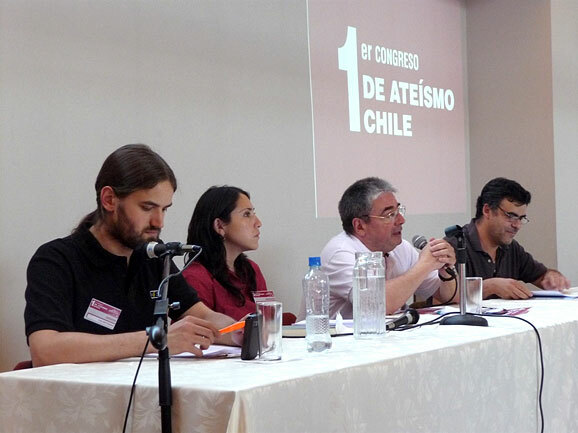 The event had good press coverage and was attended by representatives of secular institutions from Chile and Argentina, as well as Protestant and Catholic members. 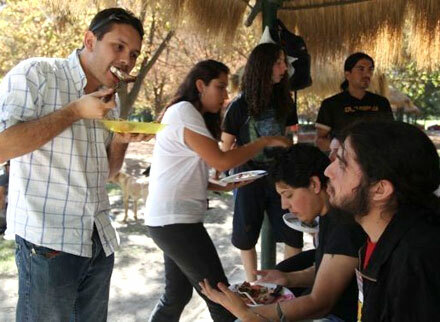 In April 2012, again the Atheist Society made ​​a widespread appearance in the national and Latin American press by hosting in Santiago a massive roast on Good Friday, challenging the ingrained habit of faithful Catholics to abstain from meat on that day. The event generating a feeling of camaraderie on a weekend that becomes boring and lethargic for those who don´t profess the Christian faith. The same month, the Society conducted an awareness campaign to encourage people who claim to be Catholic (again, only because of tradition or social pressure) to check the option of "without religion" on the National Census—after the strange elimination by the government of the "Atheist/Agnostic" option. Later, in August, they organized the Second National Apostasy, addressed to those who were baptized by the Catholic Church when they were newborns but have since stopped believing. Currently the Atheist Society is planning the Second National Congress of Atheism. National television (including the state-owned channel) gives space to ridiculously irrational programs dedicated to psychics and mediums. While the Catholic Church is declining, evangelicals gain more followers, and because of their fanaticism, they are a risk to the separation of church and state, reproductive and minority rights, and even for the educational system—already we have some academic pro-creationism swarming in Chilean universities. Famous TV hosts propagate conspiracy theories without any critical filter in their programs. Predictions of earthquakes everywhere by charlatans generate panic among the population, which is ironic given that Chile is the most seismically active country in the world. UFOlogists and "abductees" from around the world come to Chile to conduct conferences and various activities due to its clear and excellent sky—ideal for astronomical activity. National newspapers are pro-alternative medicine, denialists of HIV/AIDS, anti-vaccine, and spread misconceptions about scientific medicine; unfortunately their circulations and influence are increasing. I could go on with many other problems that you imagine, but there are two important things to consider: First, the urgent need not only to improve access and quality of education—as demanded by the student movements that kept the Chilean government in check last year—but also provide the skills to students to learn how to think beyond "what to think." In other words, teach them how to learn to critically evaluate the data that are presented to them through the scientific method, beyond memorization. And second, the important thing is to know that guardians of rationality do exist in these lands, striving to make sure these "demons" (to quote the great Carl Sagan) don´t continue stirring and trying to overshadow the real science and critical thinking in Chilean society.